As co-op as the campaign looks, this is what we'll be playing. We broke down the trailer for Grand Theft Auto V a few weeks back. It showcased some pretty extensive footage of the single player game, which surprisingly, looked like a co-op game. But it wasn't. The end of the trailer teased something multiplayer and today we've got THAT trailer. While it's not exactly a pure co-op experience, it definitely has the potential to be a solid co-op experience. It's called Grand Theft Auto Online and it sounds incredibly ambitious. So what are the highlights? A giant persistent world that uses the entirety of the GTA V land area. A game that actually grows outside of GTA V - it sounds like your character is going to city hop or area hop as Rockstar Games develops new content and releases new GTA games. 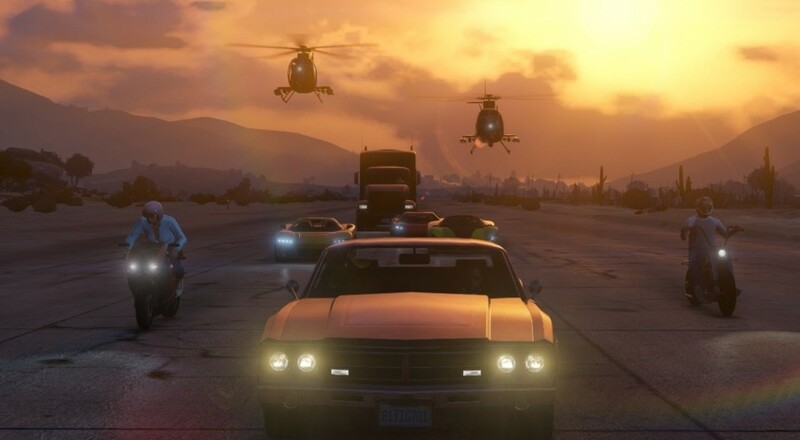 So while GTA Online is starting in Grand Theft Auto V, it doesn't necessarily end with the game. There are tons of multiplayer mini games to play like tennis and golf. There are activities to do like sky diving, biking, and just walking around being cool. You can also race friends in cars, bikes, boats and planes. Oh, and there's also a mission creator for races and deathmatch arenas. From what we can tell there's going to be story based missions to take on and friends can join in on that narrative. There's also showcased heists where players can team up to rob banks and jewelry stores and then split the loot. Sixteen players are supported in any online world, but it's unclear what the caps are for the individual missions. There's a definite focus on doing jobs and earning cash to customize not only your character, but your world. Want to buy and furnish and apartment and then invite friends over for a party? Yeah you can do that. And the best part is, if you do it in the game, no messy cleanup! Grand Theft Auto Online launches two weeks after Grand Theft Auto V launches and its access is included with every copy of GTA V. In related news if you pre-order the digital version of the game on PS3 you'll get 75% off any Rockstar Game on PSN as well as an "atomic blimp" in game vehicle. Page created in 0.6340 seconds.